I know, I know, I’m jumping ahead a whole week, but attendance on January 27 is so important, I want to give everyone plenty of warning! 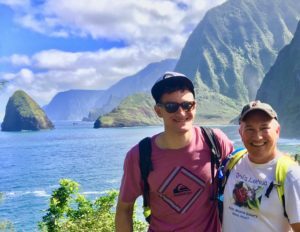 Last week, I had a fantastic time on Molokai with my son Palani where we stayed with former Koloa Union Church Pastor John Lunn. We enjoyed a trip to Kalaupapa, where a Congregational Church existed since the first year people with Hansen’s disease (leprosy) were sent there a part from their families and friends. We also hiked through the Kamakou Nature Preserve, way up in the mountains, where lehua blossoms and songs of native birds were abundant. On our last day, we hiked at Moomomi Nature Preserve, which is located along the northern coast far to the west of Kalaupapa and where native coastal flowers flourish. The trip gave me new subject matter for future watercolors. It also gave me some perspective on life at Kalaupapa over the years. The peninsula there is beautiful beyond description. It is hard to imagine thousands of people who were sent there to suffer and die far away from family members and friends. I look forward to sharing with the congregation on Kalaupapa Sunday, January 27 some thoughts from this recent trip. Church members are asked to attend our Annual Congregational Meeting after the worship service on the 27th. Besides our usual business, reporting and voting that is conducted each year, the Open & Affirming Core Team will present a draft of the “Open & Affirming Covenant” to the congregation—a task directed by the Congregation on October 21 in order to create a statement showing our openness and sense of welcome to all people, including lesbian, gay, bisexual, transgendered, and those questioning their gender and/or sexual orientation. The intention is that our members will hear the presentation and read the draft on that day, and then spend a month in discernment and prayer. Everyone is invited to consider the intention of the covenant and how it might land on others; to give input on the covenant in its final form; and to envision all people knowing that they are welcome among us. Please offer any comments or suggestions to any member of the team: Lee Anderson, Sheri Fu, John Gilmore, Michael Horning (Chair), Tiffany Marrotte, Penny Osuga, Becky Sakimae, or me. Part of the discernment is to take a look at what the Bible actually says about gender and homosexuality and the various ways particular passages are interpreted. Although there are many ways people are different (ethnicity, gender, culture, politics, etc. ), there are often strong feelings when it comes to differences in how others understand their gender or sexuality. I will offer two identical Bible studies for people who would like to read passages in the Bible and learn about how they are interpreted; there will also be time for questions and conversation. Please sign up on the church bulletin board for Sunday, February 3, after Aloha Hour in my office OR Wednesday, February 6, at 7 p.m. at the parsonage. Our Kahu (Pastor) offers a weekly message in church most Sundays during the year. Click HERE to see a video of a recent message from Sunday morning. You may see the Koloa Union Church YouTube channel to see many of his past messages and subscribe in order be notified when a new message is posted. Please share these videos with friends and invite them to church. Please feel free to “Like” any of the videos you see and share them on social media, such as Facebook, so that others will notice them.